We delivered our workshop at Bewtts Youth club as part of our social inclusion work in Wales. Campaign Worker Jason Webber delivered our educational workshop to young people at Bettws Youth club who are part of an educational project run by Bettws First. The workshop is a 2 hour introduction to the FAW Level 1 (Leaders Award) coaching Certificate for anyone who has difficulties accessing information or does not feel confident to access the Level 1 course direct. The first hour is an indoor based session discussion of what to expect from the official Level 1 course with some examples of activities. Other key aspects are highlighted, such as the benefits of coaching qualifications and where these can lead to in terms of employment and opportunities. Candidates then had the opportunity during the second hour to take part in a practical football coaching session, which will demonstrated some examples of what will be covered and learnt on the official Level 1 course. 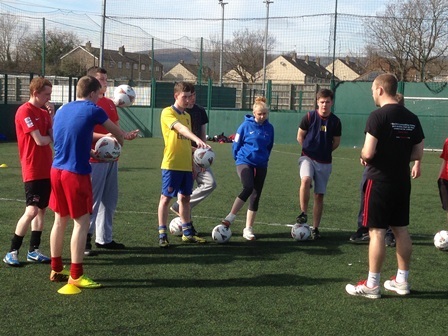 The young people all enjoyed the session and will be looking to attend a level one course in the near future.